blog.dinogane.com: Self-discipline, motivation and business school. Self-discipline, motivation and business school. Follwing pre-term, I'm a few weeks into life at Kellogg. Yet, it feels like a lot longer. It feels like we've all been here for several months. The coursework load has started to ramp up. Clubs are recruiting people for leadership positions. The social scene is still lively. I feel like I'm stretching my time as far out as possible and struggling to keep up. Perhaps the problem is simply self discipline - sticking to what I had planned to do and getting things done. By self discipline, what I really mean is motivation. Yet considerable thought and recent experiences have led me to a time-honored simpler answer. I would once wake up in the morning and lie in bed for an extra hour. These days, that hour has chopped down to a few minutes. I think this is what is necessary to operate in the business school environment - greater and greater self control of your urges. I'm realising that this is one of the things I need to really master. There is probably just enough time to keep up with only the readings and coursework for classes. Adding clubs, career pursuits, socialising and everything else means there is less and less time for procrastination and distractions. Yet, I find it difficult to not let my mind drift to other things - especially while reading dense text that was probably designed to test your reading stamina. If I am to achieve everything I want in these two years - self discipline will surely be key. Yet, self-discipline does not have to feel like self-discipline if there is motivation. The stronger the motivation, the quicker things happen and the less procrastination there is. I expect to finish writing this blog post within 30 minutes, for example, simply because I am motivated to keep writing and also motivated to get back to dealing with the rest of the stress of business school. Yet, when it comes to completing assignments for some classes - the motivation is not there: minutes become hours. Soon, I'm already behind and scrambling to keep myself interested to keep going. So beyond self-discipline, if I am to achieve everything I want to out of business school, I need to learn to motivate myself to do those really hard things - those things that are easy to put off. I need to be motivated enough to complete them quickly and move on. It is easy, when faced with such a torrent of work, to forget to take time out for one's self, an essential 'decompression' factor in preventing burnout, and in ensuring quality in one's work. Make sure you schedule some 'alone' waking time; preferably the same time every day, wherein you will be able to exercise, meditate, explore a nature trail etc. This will serve to recharge the mental resolve. Additionally, be mindful that your current environment is designed to tests one's mental capacity for discipline and making proper decisions. It is very American, thus 'upper-conscious,' frenzied, and certainbly based upon the college 'Greek' system, from what I've read here. You should never take your eye away from the goal, the reason you are there, and the purpose for seeking the specific tools with which to apply yourself towards said goal. If you allow yourself to be caught up in the environment too much, you will simply become 'brand Kellogg' rather than 'brand DG.' A somewhat nonsensical proposition, considering the huge effort you have gone to, and will go to, in order to fulfill a dream. The person who sets the agenda controls the outcome. Thanks for the support, MRP. Your thoughts have been in the back of my mind, but it is good to have it vocalized. I am struggling myself with motivation and discipline right now. I (again) started too many things at once and now I have to see how I get everything done. there's the gmat, the applications, the business I started, the blog I'd like to keep up-do-date, the photos & videos of my trip I'd have to go through and my apartment/office I am completely remodeling. I actually thought about writing about my challenge, but haven't 'had the discipline' yet to sit down and just do it. and now you posted something that sounds so similar. btw - I was off coffee too, but started again drinking it last week. 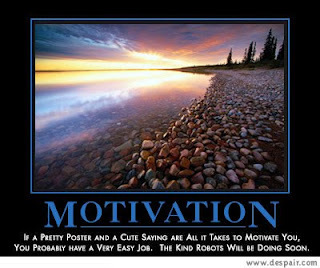 Just think how good we will be at motivating ourselves after two years of this... ;-).